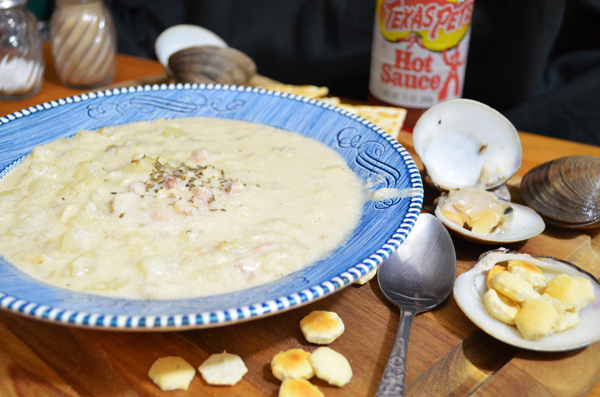 Follow our easy, step-by-step, photo illustrated recipe to make this delicious Clam Chowder. We’re using fresh clams, and we’ll show you how to clean them, and how to prepare them, then turn it into a really hearty clam chowder you can enjoy anytime of the year. Using fresh clams will be easier than you might think. Printable recipe included. Clam Chowder made with fresh clams. Either you love it… or you don’t. Some folks might be a bit finicky about eating shellfish, some might not really like the taste, but most of us… LOVE IT. I hope you will too. This is not one of those old Southern favorites that I grew up with. Mama never made Clam Chowder that I recall. I was probably a married man before I ever tasted it myself, but I liked it from the get go. Chowder is a great dish to serve on a cold evening when you need something to warm up the insides. But, it’s a great dish all year around, probably because it reminds us land lovers of those all too infrequent trips down to the beach. You’ll often find it served as an appetizer soup dish before a big meal of fried shrimp, oysters and fish. We have a good number of seafood restaurants here in North Carolina, and most of them feature Clam Chowder on their menu. We served it at Captain Gordon’s, my older brothers seafood restaurant many years back. I do hate to admit it now, but what we served came out of a can that we always added milk and a few other ingredients to help boost the flavor. Customers seemed to have liked it though, especially with our Captains Platter which we served up for two. Two bowls of clam chowder, and a great big plate piled high with lightly fried fish, shrimp, oysters, clam strips, and two deviled crab. It was a big meal to be shared by two people, and we sold a bunch of them. For Clam Chowder with FRESH clams, we had to be near the beaches of Carolina. What is it about going to the coast and having to eat seafood? I’m using fresh clams for this recipe. If they aren’t readily available for you, you can certainly substitute frozen or canned. You’ll lose a bit of the “experience” of working with fresh clams, but you’ll still end up with a very tasty chowder. There’s a roadside market about 20 miles down the road from me, that sells fresh seafood from the coast each weekend. They bring it up from their shop in Wilmington, NC each Friday around noon, and sell that evening, and all day on Saturday. What’s leftover, is reduced in price a bit on Sunday, and sold until they sell out. They have a good reputation, and I’ve made several trips down that way for fresh seafood. The clams in this recipe are littleneck clams from Sneads Ferry, NC. In the steps below, I’ll show you how to “purge” the clams, to remove any excess sand that might be inside those shells. 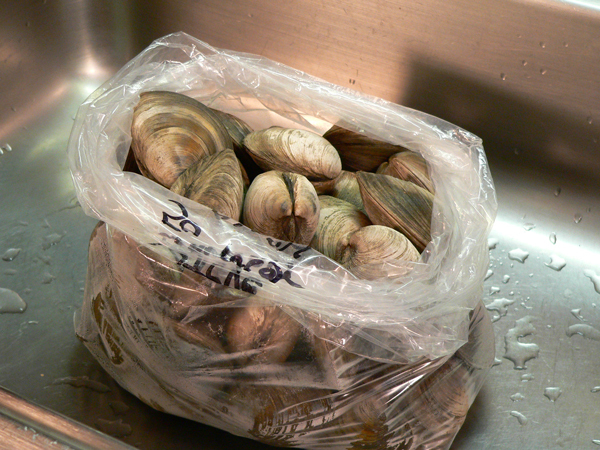 You don’t want that in your chowder, or any other recipe that might call for fresh clams. It’s not complicated, but does take about an hour to accomplish. If you’re not using fresh clams, the overall time to complete this recipe will be shorter. Salt Pork was my seasoning of choice. Bacon could be used, but I didn’t want that smokey taste in my chowder. It added to the overall saltiness of the chowder, so let me just warn you now to taste your chowder BEFORE you even THINK about adding additional salt. So, if you’re excited about making Clam Chowder from scratch, let’s get everything setup in the kitchen and… Let’s Get Cooking! 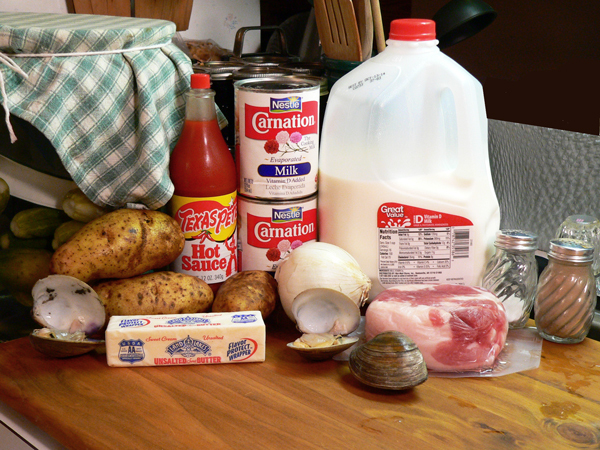 Clam Chowder Recipe: You’ll need these ingredients… plus a few more clams. Actually, you’ll need about 50 clams of medium-to-large size. 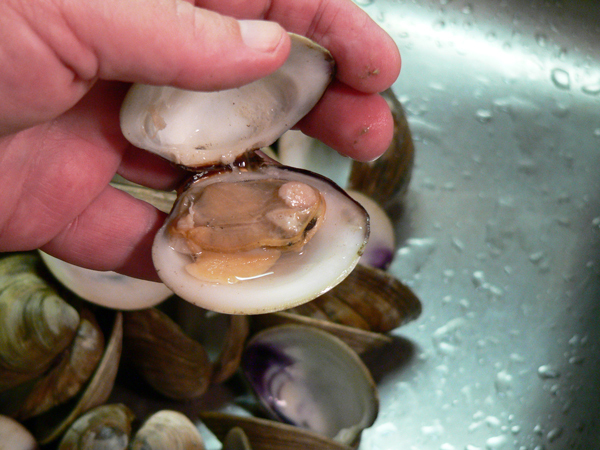 Fresh clams can be kept in the refrigerator for 2-3 days if you do it properly. These came in a plastic bag, which I was told needed to be left open at the top before placing them in the refrigerator. I knew I’d be using them the next day, so I just placed this bag inside of a sheet cake pan, and placed it in the fridge. The next day, I placed the fresh clams in my sink. You need to carefully inspect each one to be sure you toss out any bad one’s . If they are chipped, cracked, or broken, they need to be tossed. If they are open, and do not close when tapped gently on the shell, they are dead and need to be tossed as well. It’s very important when handling shellfish, that you store them properly, and that you remove any that might be in question. As the old saying goes “If in doubt… throw it out.” Better safe than sorry. Here, I’m looking at the edges of each clam, to make sure they are closed tightly and without any broken places, cracks, or chips. I must say, these were in excellent shape. I only tossed one out of the bag of 50. It’s also a good idea to “purge” the clams, to remove any sand that might be inside of them. Clams live in mud, and they pull sand inside their shells as they breathe. Just as you want to clean them on the outside, it’s also best to clean them on the inside. 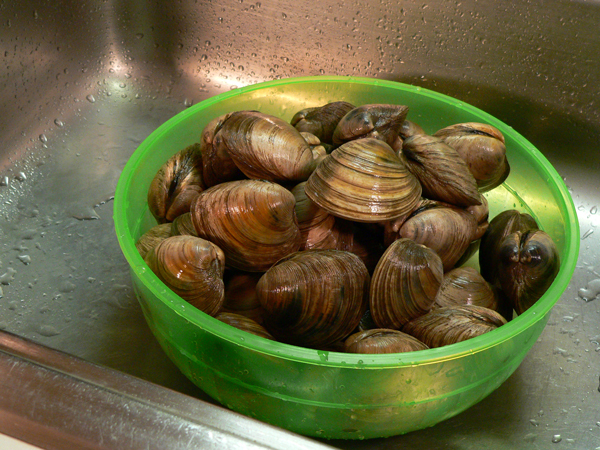 Because I had 50 of them, I placed the clams in my sink and covered them with cold water straight from the faucet. Then, I added about 1/3 cup of salt to the water. Some folks even add about the same amount of cornmeal to the water. Let the clams sit in this salt water for about 30 minutes. Hopefully, all the clams will take in the fresh water, and spit out any sand, so it doesn’t end up in your chowder. The idea behind the cornmeal is that the clams would take that inside their shell, then they would spit it back out, sending any sand out along with the corn meal. I opted to just add the salt. 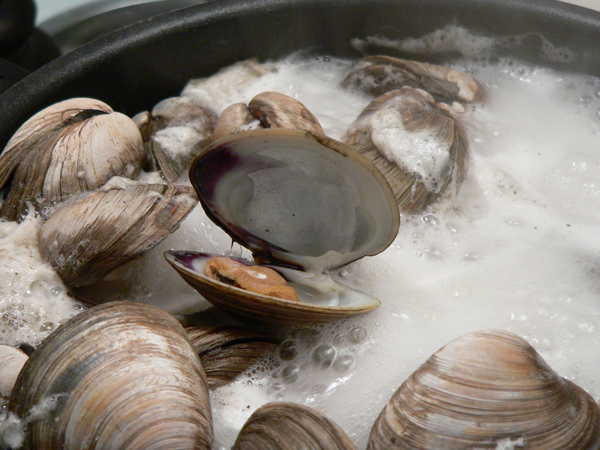 After 30 minutes, DRAIN the water off the clams, and REPEAT the process at least one more time. 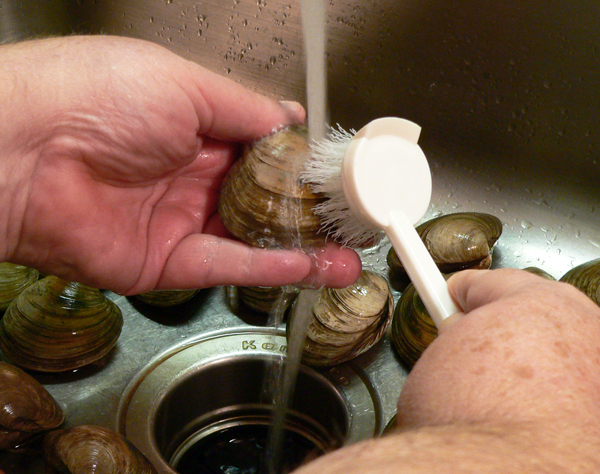 After you’ve purged them twice, drain off the water and start scrubbing each clam. You can rinse them off with just your hands, or use a vegetable brush to help remove any dirt from the shells. I did this under cold running water, then placed the cleaned clams in a separate bowl. At this point, the clams have been given time to purge themselves of any sand, and have been fully scrubbed clean on the outside. Again, I was inspecting each one, looking for chips, cracks, or broken shells that needed to be tossed out. All of the clams were closed tight, so they went back in the refrigerator, uncovered, until I could get the other items prepped for the recipe. When ready to make the chowder, begin by steaming the clams. 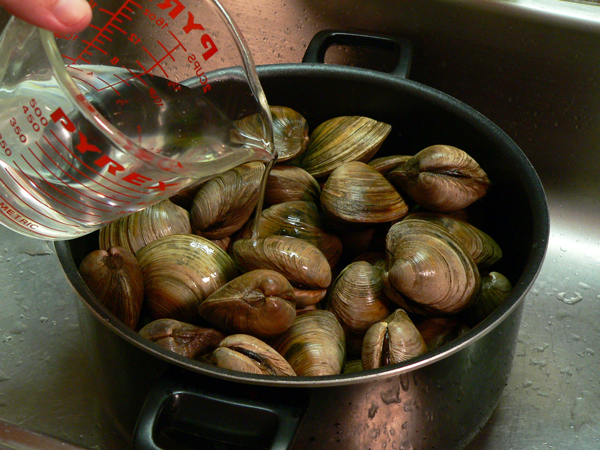 Place the clams in a large sauce pot, and add about a cup and a half of water. I really should have done this in two batches, and I’ll explain why in just a moment. 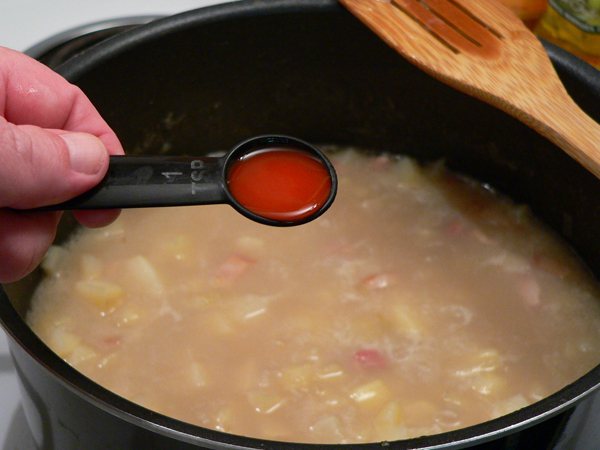 Place the stock pot on your stove top, and set the heat for Medium-High. Cover the pot and let it quickly come up to a rolling boil. 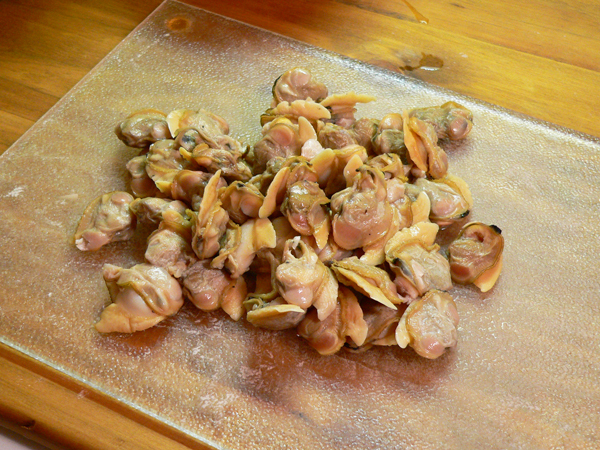 The clams need to cook for about 8-10 minutes, or until the shells begin to pop open. If you give them enough room, the clams will really pop open this much when they are done. If they only open part of the way, let them cook a bit longer. If they don’t fully open, those need to be discarded. Only one of mine failed to fully open like this one in the picture, so I tossed it. The clams really needed more room than what they had in this pot. That’s why I say they should have been cooked in at least two separate batches. The one’s on the bottom were popping open much sooner than the ones on top, and by the time I realized this, they were starting to cook a bit too long. If they overcook, they will be tough, and you don’t want that to happen. Stir them around a bit, looking for the one’s that have popped open,those need to be removed immediately. I used tongs to lift them out of the water. Don’t worry about any liquid in the shells, just pour it off into the pot. 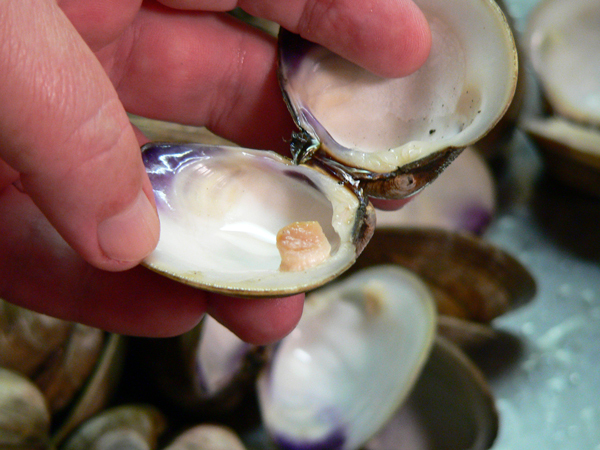 Work as quickly as possible, removing open clams as you see them. Place a colander over a bowl, and place the open clams in the colander as you remove them from the pot. You want to save as much of the liquid as you can and let the cooked clams cool. Can you see how they are all wide open? Remove the sauce pot and the liquid from the stove top. Set it aside and let it cool. DO NOT THROW THE LIQUID AWAY. 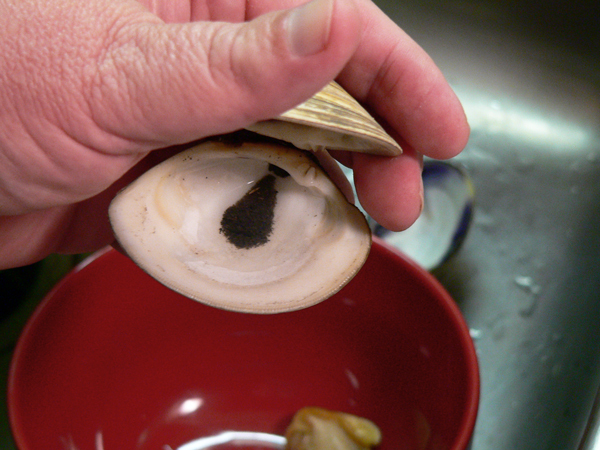 As the clams cook enough to handle them, scoop out the meat from inside and place it in another small bowl. Do this carefully, because their could still be some sand inside the shell. You’ll also want to keep any liquid that might be inside the shell. I just pulled the meat out with my fingers. Once the shell pops open, the meat is fairly easy to remove. You could also use a spoon or butter knife to scoop out the meat. Here’s a little sand that was left inside one of the clams. I saw it before I dumped it into the bowl, so I was able to pour it out. Amazingly, this was the only one that I found in the whole batch. I did find about two pieces of clam meat that had this black sand on them. I just gave them a quick rinse under some cold water and washed it away. You don’t want that going into the chowder. As you remove the main body of the clam, you’ll probably notice a small cylinder shaped piece of meat still clinging to the shell. Don’t toss it away, use your fingers to pull it away from the shell, or use a knife to scoop it out. These little nuggets of sweet meat are a bit chewy but tasty. There isn’t much meat inside the clam shell to begin with, so save all that you can. I found myself sampling more than one of these little nuggets as I cleaned out the clams. Not a lot of meat for the effort is it? But, between the meat and the liquid in the pot, we’ll get plenty of that good clam flavor in our chowder. The meat needs to be refrigerated until ready to go into the chowder. I decided to chop them up first though. You’ll need a good sharp knife to chop them with. 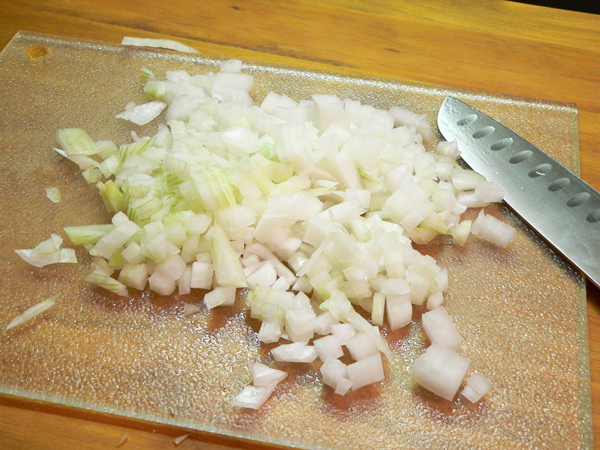 Spread them out on a cutting board, and chop them up into very small pieces. I chopped these a bit more after taking this picture. We will not add the clam pieces until the very end of the recipe, so place them back in the refrigerator until you’re ready to use them. If you think it will be awhile, you might want to cover them to keep them from drying out and getting tough. Let’s get started with making the chowder. 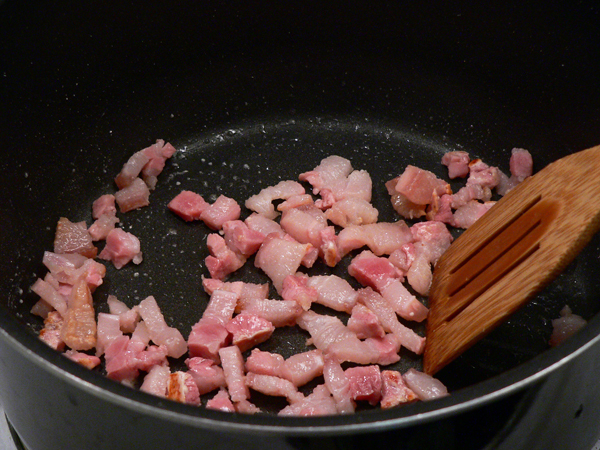 You’ll need about 4 ounces of salt pork. Cube it up into very small pieces. 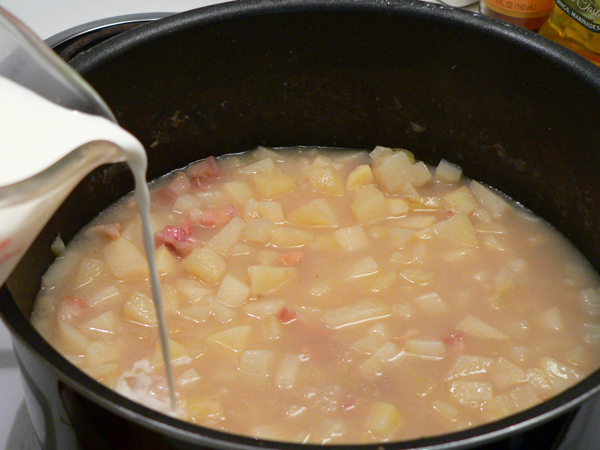 Place the cubes of salt pork in a large sauce pot, one large enough to make lots of clam chowder. 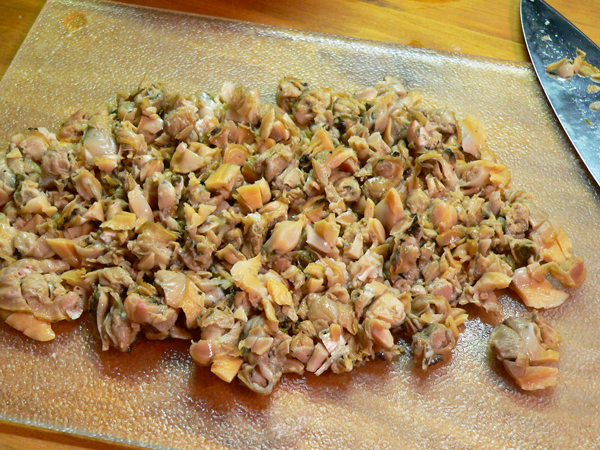 Set the heat to Medium, and continue to stir the pork as it begins to lightly brown. This section of pork was pretty meaty, so there wasn’t much fat that rendered out from it while it cooked. If you’re using some with more fat, you might want to drain off some of the fat once it has lightly browned. Too much fat will make the chowder a bit greasy once it’s finished. A Tablespoon or two of liquid fat is about all you’ll need. Keep an eye on the salt pork and don’t let it burn. Then, while it’s cooking, go ahead and dice up the onion. Add the onions to the sauce pot. Cook the onions until they are tender, and slightly translucent. Keep stirring them around, and don’t let the pork pieces get all dried out. Dice the potatoes into small pieces. 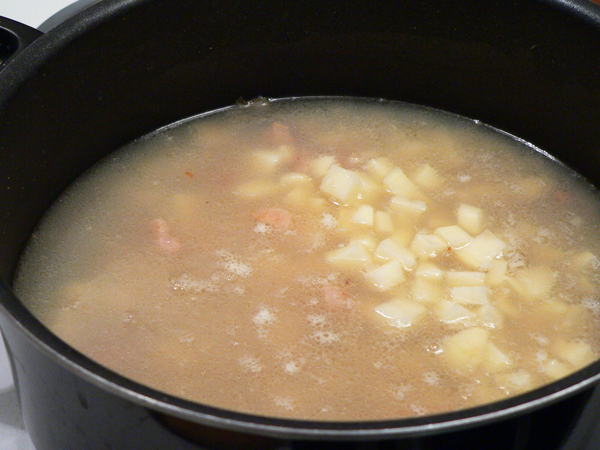 Some folks use bigger chunks, but I like the smaller diced potatoes in my chowders. Add the diced potatoes to the pot. This is the broth from the pot where I steamed the clams. I poured it all into this bowl and have let it cool. Now we need to drain off the good parts, and leave any sediment that might have settled to the bottom at the bottom of the bowl. 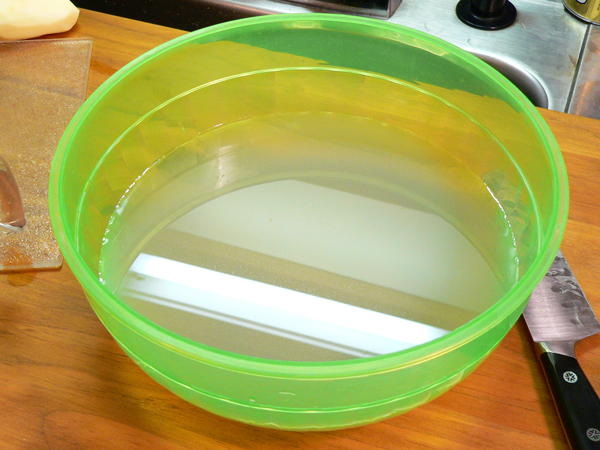 Carefully pour the liquid into a measuring cup or another bowl. Do this carefully, and leave any sediment in the bowl. It’s best to do this over another bowl as opposed to doing it directly into the pot with the potatoes. That way, if you slip a bit, you don’t end up with the sediment mixed in with your chowder. There wasn’t a lot, as you can see. Pour the broth into the sauce pot. You need enough liquid to fully cover the potatoes. If the broth isn’t enough, just add water as needed. 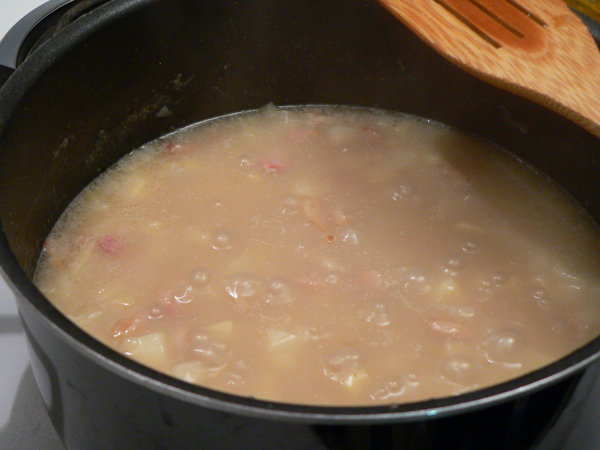 Let the mixture simmer just below Medium heat, until the potatoes are tender. You don’t want this at a rolling boil, just a slow simmer. 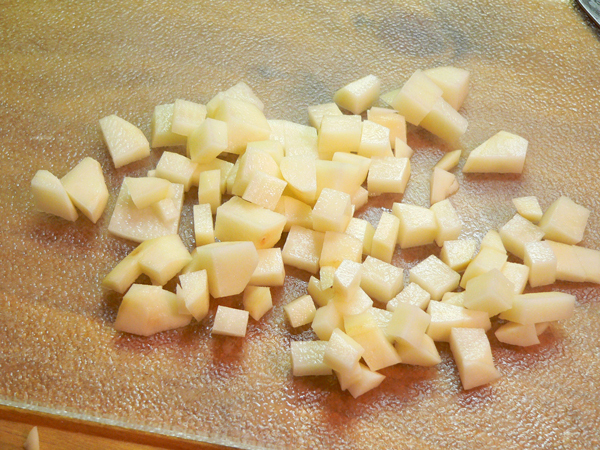 With the potatoes diced as small as they are, it will only take about 15 minutes for them to fully cook. Just taste one to see if it’s as soft as you’d like. At this point, I thought about getting out the Immersion Blender and running it around inside the pot for a few seconds. I thought this might make the chowder a little creamier, which it might would. Talked myself out of it though. Add the Texas Pete Hot Sauce. This is just for a little flavor. We’re not using enough of the hot sauce to actually make the chowder “hot.” Normally, we’ll serve up extra alongside the bowl of chowder. 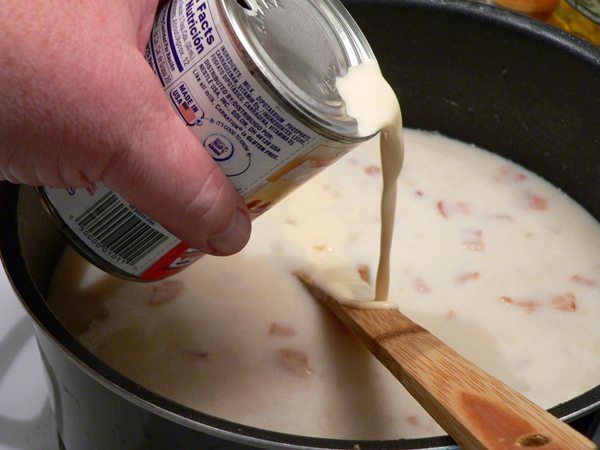 Add the can of Evaporated Milk. You could add Half-n-Half if you have that on hand. The evaporated milk is much cheaper in my area though. 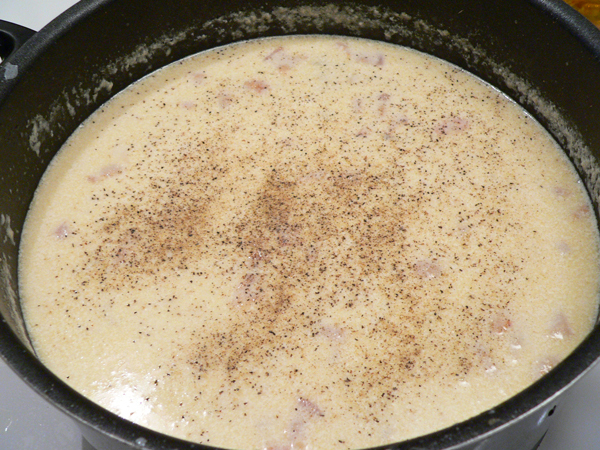 The milk adds to the texture of the chowder, with the whole milk basically just adding bulk, and the evaporated making it a little creamier. Stir the milk in well, and bring it almost to the point of a low boil. Do this slowly, so the milk doesn’t “break.” You really don’t want to let this boil at all. Keep stirring, especially down to the bottom, and let it simmer on low for about 5 minutes or until good and warm. You’ll also need to taste the chowder at this point to see if it needs any additional salt. I seriously doubt that you will, but taste it just in case. You could also add some Black Pepper if desired. I must admit, my chowder was a bit on the salty side. I hadn’t added any actual salt to the mixture, but the combination of the Salt Pork and the brine from the clams, made it a bit salty. You could dilute the chowder a bit more by adding more whole milk if this happens to you. Just be sure to taste it before you even attempt to add additional salt. You can thank me later. Once the milk is warm, add the unsalted butter and the chopped clams. The clams are already cooked of course, and they don’t need to actually cook any longer. Just let the butter melt, stir everything together well, and you’ll be almost ready to serve. If you prefer a thicker chowder, crush up some oyster crackers and stir them into the mix. I placed about a cup of the crackers in a ziploc type bag and crushed them up before adding them to the pot. Stir them around real good and they’ll blend in well. 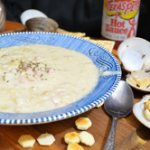 Follow our easy, step-by-step, photo illustrated recipe to make this delicious Clam Chowder. We’re using fresh clams, and we’ll show you how to clean them, and how to prepare them, then turn it into a really hearty clam chowder you can enjoy anytime of the year. Using fresh clams will be easier than you might think. 4 dozen littleneck clams, or 1 quart of shucked cooked clams with broth. 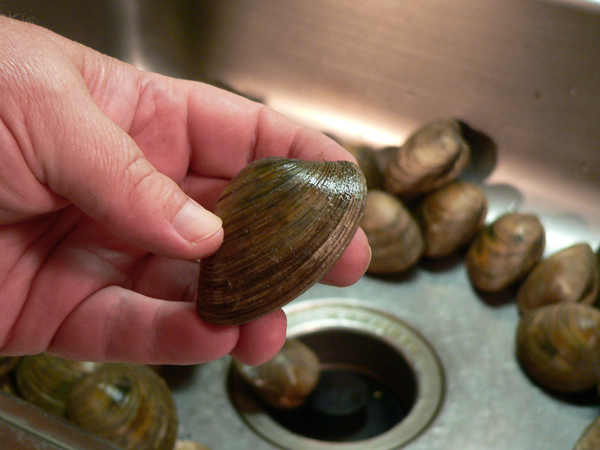 Place clams in a clean sink, discarding any that are cracked, chipped, or broken. Also, discard any clams that don’t close when their shell is lightly tapped. Add enough cold water to completely cover all the clams. Add 1/3 cup of salt. Let clams sit in water for 30minutes to purge out any sand. Drain the sink, rinsing away any sand or debris. Repeat the process at least once more, maybe twice, until the water is free of any sand. 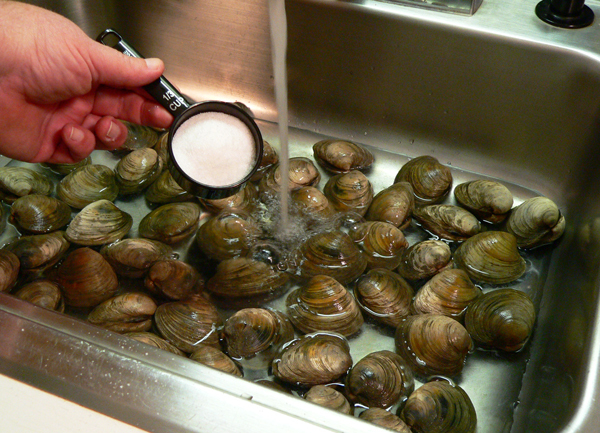 Use a stiff brush to scrub each clam under cold running water. 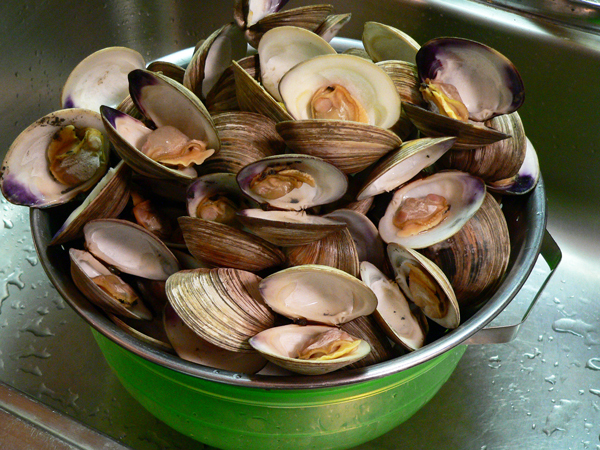 Keep clams in the refrigerator, until ready to proceed with recipe. 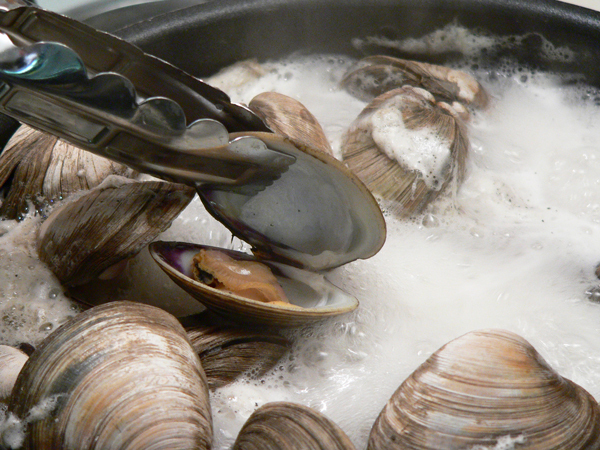 Place cleaned clams in a large pot. Cover pot and bring to a boil. Let boil until clam shells open. About 10 minutes. Place a colander over a large bowl. 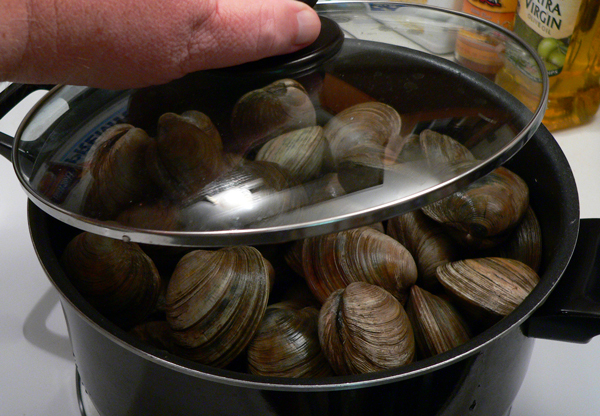 Remove open clams, one at a time, place in colander to drain. Reserve drained liquid, and any liquid remaining in the pot. Allow to cool. Shuck clams and set meat aside. Carefully pour off cooled broth from cooking pot, reserving the liquid. Drain pot carefully so as not to disturb any settlement in the bottom of the pot. Place a large saucepan over medium heat on your stovetop. 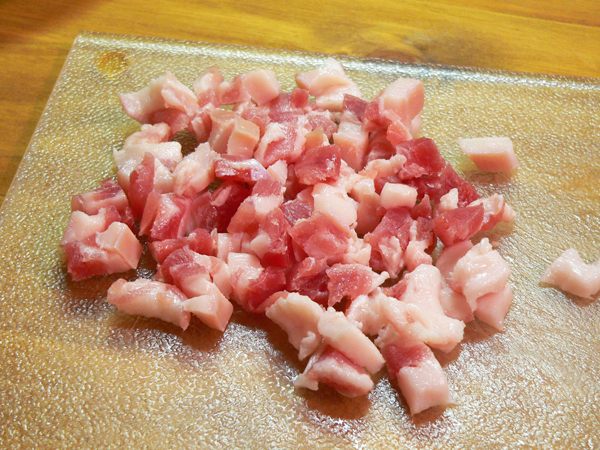 Dice the salt pork into small cubes. 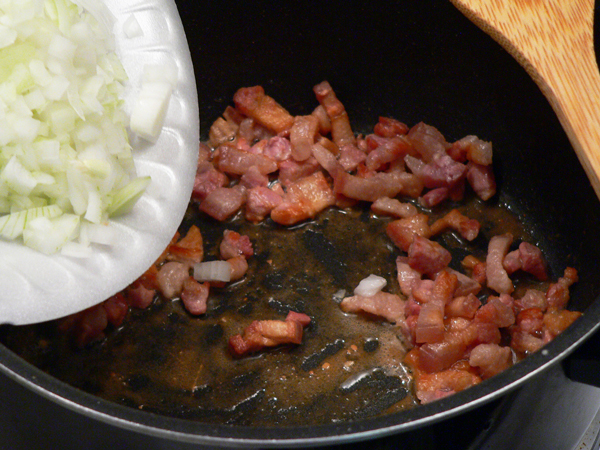 Add the diced salt pork. Cook pork until slightly brown, but do not let burn. Pour off about half the fat if you have an abundance. 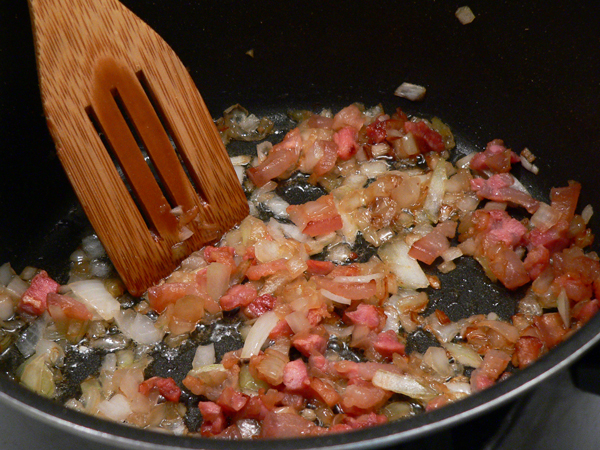 Add onion to the saucepan, stir and cook until tender. Dice the potatoes into ¼ inch cubes. 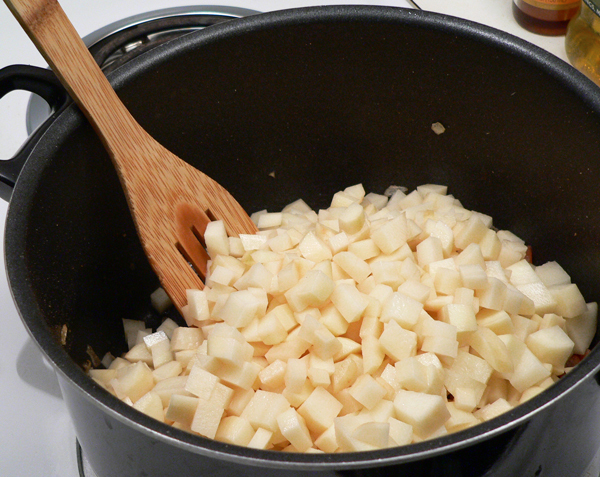 Add diced potatoes to the saucepan. 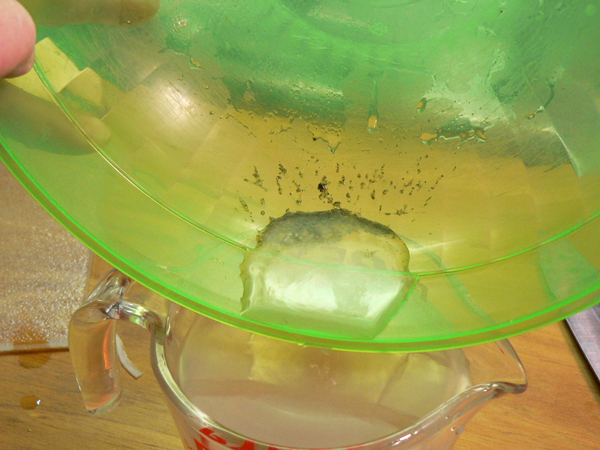 Carefully pour off the broth, letting any settlement remain in the bowl. Add clam broth to the saucepan. Potatoes should be covered with liquid. Add water as needed to cover. Let potatoes simmer until tender. About 10-15 minutes. Add evaporated milk, stir well. Bring to a light simmer, stirring often for about 5 minutes. Taste the chowder. Add salt if needed, and black pepper to taste. Add Texas Pete Hot Sauce. 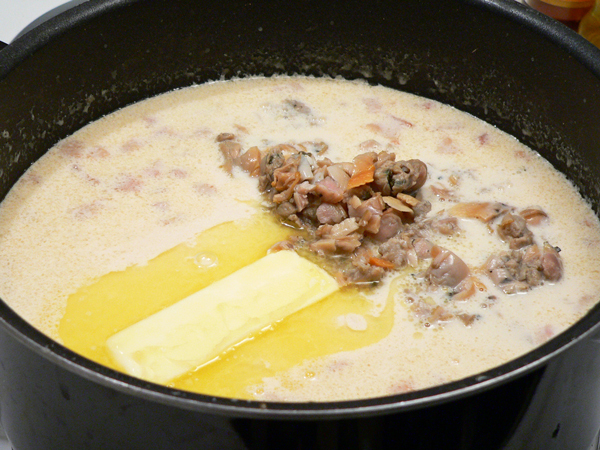 Continue to stir and simmer, until butter is melted and clams are heated through. Do Not Boil. 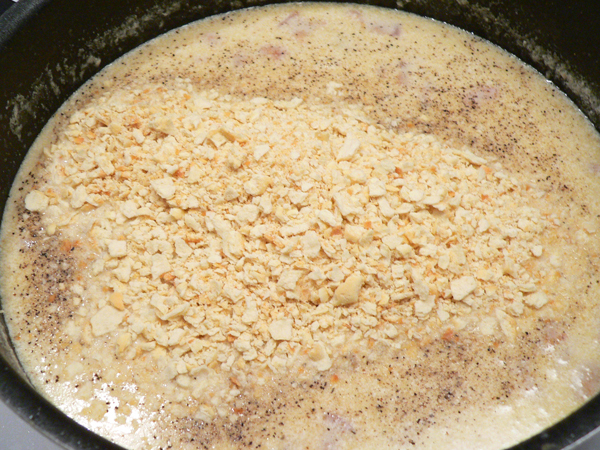 Add finely crushed oyster crackers as needed to thicken the chowder. Prep Time is based on using fresh clams. Some folks add about 1/3 cup of corn meal to the salt and water they are using to purge the clams. If the clams open and take in the corn meal, they spit it back out, sending sand out at the same time. Your Comments: I’d love to hear your comments on our recipe. It will only take a minute or two to share your comments with us in the Comment section below. And, if you try our recipe, your comments on how it turned out for you, just might cause someone else to try it as well. Please know that all comments are moderated. That just means that I personally read each and every one of them before they are approved for our family friendly home here on the Internet. Your comment will not appear immediately, but I’ll get it posted just as soon as I possibly can. Thank you in advance. Your recipe is the closest to mine that I made several years ago. I used clams that we dug ourselves. We kept them in strained Puget Sound water outside if it was cold, in the garage, or the basement if it was warm. By changing the water they cleaned themselves. By the way, cornmeal is way to big for them to use. It has been so long since I have had it and have been hungry for it that I bought canned New England clam chowder and added canned chopped clams and whole canned ones. It was barely ok so I decided to Google it and found yours. Thank you very much! I’m making this recipe this evening. My little girl loves New England Clam Chowder. But what actually caught my eye was the Currier and Ives bowls in the first picture.